Due to the large amount of fiber with the prunes, help prevent or relieve constipation in your baby, especially if you’ve already included solid foods in your baby’s diet. You can soak the prunes and puree them or combine them with cereal or apple sauce then can serve as a natural, nutritious and delicious dessert. Because the broccoli contains fiber, calcium and sulfur, also some anti-cancer properties, give a unique flavor that allow your baby develop optimally its palate. To terminate the strong feeling, it is recommended that, cut Broccoli into pieces, then steam and freeze; this will help to soothe itchy craving your baby’s gums caused by teething. Although beef is considered a strong food for babies over seven months, but you can begin the taste of this kind of food for babies. Do not forget that the meat contains a lot of zinc and iron, which give your baby a strong immune system and develop the senses of taste and smell. It is recommended to mix with vegetables, and it should be smooth to make it enjoyable to eat. One of the benefits of pumpkin is that its flavor is sweet and pleasant, also is smooth and somewhat creamy, contain vitamins A and C. So do not hesitate to include them in food for Babies development. You can steam or boil and add some cheese, either white or parmesan. Pumpkin can be combined with almost any food. The chickpeas are versatile in nature, containing legumes high in protein and fiber, also are economical. You can also roast or sauté and make a kind of snack. Chickpeas recommended for babies 12 months or up. Curiously, the unsaturated fat from avocados is similar to breast milk, which favors to growth of your child brain, so it is ideal for your baby as a fruit. Combine mashed avocado with apple, cream, cheese or fish. Remember, it should be in small pieces. You can also mix delicious mango puree with avocado. Add it to feed your baby as a snack. These are one of the grains more nutritious because of their protein and fiber nature, also contain much iron. 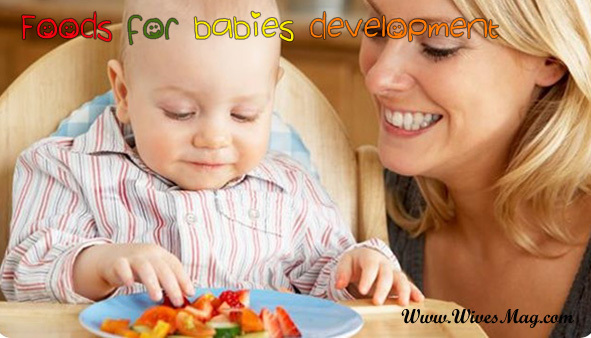 However, much essential for babies development. Ready them to your season, and combine them with vegetables like carrots, potatoes or squash. You can also serve with rice. Another tip is to cook with bay leaf, oregano, will give a special flavor. A very sweet fruit antioxidants and contains vitamin C. You can also make juice, it tastes is less bitter than orange, which can please your baby. Also remember that foods with vitamin C help prevent diseases such as influenza, ideal for cold weather. The spinach is rich in iron, which helps your baby to develop active skills and enhance the function of brain. Steamed spinach or sauté with olive oil along with a handful of vegetables is helpful; you can add some cereal too. Quantities may be half a cup of spinach for two tablespoons of cereal. « Healthy recipes: Detox water for liver detoxification » Boho decorating Style: How boho decor emphases the look of your home?